Designed specifically for traders. While not a knock off of Twitter, Facebook, Pinterest, or LinkedIn, the design was inspired by the holistic consideration of the best features of each. Your website users will be able to create, share, and exchange information and ideas in a virtual community via network which you control and administrate. 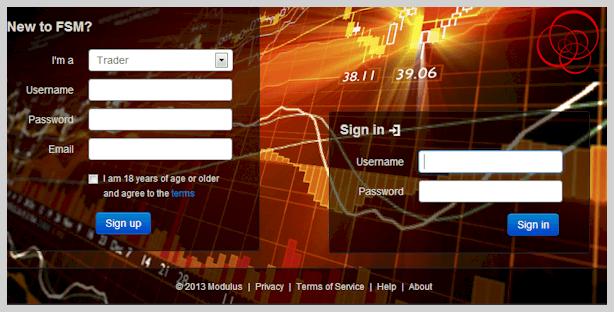 You can change colors and styles or add new features, such as the ability to share MQL, EasyLanguage or TradeScript programs. Want to share chart files? No problem. There is no limitation to your customization. You're in complete control of your site's look and feel, and it blends seamlessly with your existing brand. Monitor your social media site stats at all times with our advanced reporting. How effective are your marketing and promotional campaigns? Compare the performance of campaigns and fine-tune your approach in real-time. Worried about fraud? Don't be. The site ensures members are genuine; spambots won't consume valuable resources or solicit other members. Features include message filtering and email confirmations for new accounts. It's in our best interest to provide you with the best developer support possible. Free source code updates and technical support are provided for one year. Free setup and training are also available. Click here to try an online demo. You can sign-in using test/test. Make sure to resize your browser to see the fluid and responsive layout in action. Don't forget to try the site on a tablet or smart phone, too. 2. Name your social media site. 3. Tailor the look and feel. 4. Install the SQL tables. 5. Upload the files to your server and set up the photo server*. Requires IIS 7 or greater. *Photo server requires a compatible mail server, such as MailEnable Standard (freeware). Remote setup assistance is available. 100% plug-n-play, white-label social media website. Create your own Twitter, Facebook, Pinterest or LinkedIn style social network for the finance community. Highly optimized and load tested for millions of users. Maximum theoretical capacity is around one billion users, if scaled. Complete C# source code with comments and developer support. Uses the modern responsive-layout, Twitter Bootstrap, as the framework. Highly efficient, well-written code uses multiple caches. Provides a sleek, responsive user experience. Load tested to 200,000,000 simulated clients on a single Amazon EC2 m1.large cloud server. Pinterest style AJAX picture profile loading and loads new pictures as you scroll down. Ranks users by sign-in frequency, registration date, and other customizable weighting factors. Uses Twitter-like @ tags to address users and # tags for topics. Provides a Twitter-esque "Trending Topics" feature. Messaging is similar to Twitter. Email-based picture uploading similar to Flickr... users can take screenshots of charts or pictures via their computers and smart phones, then email the pictures to their account. Advanced picture gallery for viewing member pictures… works on tablets, phones and desktops. Shows users' online or offline status. Advanced high-performance memory caching and real-time logging. Advanced security can block users from certain countries. Built-in affiliate signup, payment tracking and reporting hooks. Email confirmation system for new account signups. Features change-password / forgot password functionality and account settings. Modern design based on Twitter Bootstrap and HTML5. Fully responsive design works on Android, iPhone, desktops and more. One code-base works on all devices. An advanced spam filter prevents sharing of email addresses and phone numbers, even if spelled out. Profanity is automatically filtered from usernames and messages. 100% white label. Simply add your logos and company name, upload and run! Code and tables have built-in hooks to enable moderation of pictures, profiles and messages. Amazon EC2 m1.large or equivalent (12 GB RAM, multi-CPUs) with MS SQL, 60GB system drive, 1TB data drive.